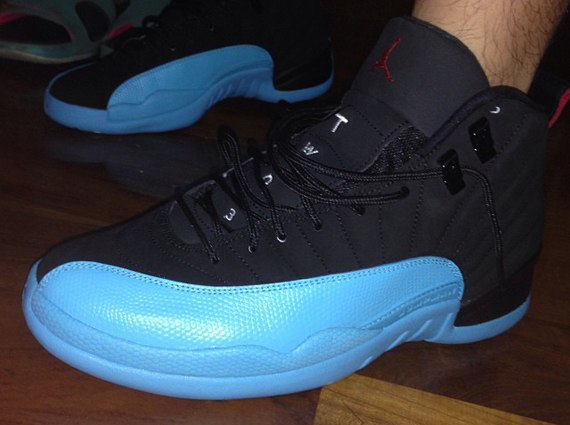 The last quarter of 2013 has brought many versions of the Gamma Blue theme from Jordan Brand. This time the Air Jordan 12 is adorned with it. The Air Jordan 12 “Gamma Blue” features a gamma blue outsole, midsole, and mudguard; black nubuck upper; and varsity red accents. It will be a holiday QS (quick strike) that releases the day after Christmas. Don’t bother putting these on your wish list, but maybe you could use those gift cards and money gifts that you receive to buy them. Again, they will be a QS releasing December 26, the day after Christmas, and will carry a price tag of $170.